2012 - Marketing & Brand Strategy. Steve Poppe, Founder. Bosch is a brand I’m familiar with on a couple of levels. First I know the name, so that means I’ve seen it on product, in retail and probably advertising. Second, I have brand associations, but across a couple of types of products: brakes come to mind, automotive products, some speakers. So it seems Bosch is some sort of conglomerate… like GE. Also they feel European. But about 2 or 3 years ago, Bosch started advertising in my the newspaper, The New York Times. I don’t recall seeing Bosch on TV, in radio or online, just the Times. And they have kept up the media pressure. With drumbeats. The ads are all focused on kitchen appliances. I wasn’t aware they were in that business. And the appliances are beautiful. No skimping on the photography costs here. I cannot recite a headline or copy points, though these ads are burned into my memory. Product as hero, at its best. Here’s what I know and feel thanks to the advertising: the product design is spectacular, the engineering way above average (that’s what good industrial design will earn you) and the appliances quiet and efficient. Most important, they are now in my consideration set where once they weren’t. 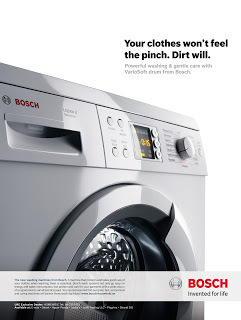 I am not a fan of awards ads and today Bosch ran one about customer satisfaction with their dishwashers. It was a prudent choice to wait so long to do an awards ad. The seer in me says, Bosch is gaining in market share and the blocking and tackling they are doing – beyond excellent product design – is the cause. Old school. Peace in the New Year. I was reading today about a New Year’s resolution type of promotion by the people who bring you the George Forman Grill. It’s not George Foreman, by the way. (He sold out at the right time.) The promotion gives away $2,500 a couple of times a year to a person who loses the most weight using the George Foreman grill. Weight Watchers and others in the weigh loss space will tell you this is the time of year to push weight loss, as many diets start after the new year, so for George Foreman it makes sense to do this now. I refer to this as the pent up demand approach. What smart about the promotion though, is that the grill is not a weight loss product or program – it’s a weight loss accessory. Something one can buy, unlike a Jenny Craig membership or elliptical machine, that is not a direct part of the weigh loss solution; rather it is part of a behavior change that encourages weight loss. Dieting is perhaps the most common and futile exercise known to man. But behavior change, that’s different. Grill your food rather than fry it and you are taking a baby step. And it’s not an onerous step, unless the food tastes bad. Advertised weight loss programs are pregnant with negative overtones. Villainously so believe some consumers. Dieters need to feel in control. And accessorizing is a smart way to go. Peace. How can an consultant come into a company, study data, ask 200 questions, drive around with salespeople, and begin to think s/he can tell a CEO or C (fill in the letters) about the heart and soul of that company? Or tell the CEO what will make the company grow at an out-pace rate. What customers want — and the best way to sell them. It’s ridiculous to think a consultant can do that. But that’s what brand planning consultants do. So how does a brand planner present findings in such an uphill setting? First, the planner shares data the C-level can’t disagree with. Data doesn’t lie. Plus, the data often comes from the same executives to whom the planner is presenting. Second, present observations. Who can argue with an observation? It’s not a recommendation, it’s a carefully selected, important piece of field work. And, if spun with elan and poetry it can become powerful and memorable. “Peter Pan Syndrome,” for instance, is something I shared while working on Microsoft. Not really forgettable. Third, organize the big picture stuff in a way that allows for leaning moments driving Cs toward a POV or conclusion. A conclusion they will get to before it is presented. Fifth, give them a brand strategy that is brand-familiar, competitive, and with eyes up — toward the horizon. Also, one that makes the Cs feel a little uncomfortable. More often than not, in a great brand strategy there will be a word with which they disagree. The beauty of the word is that is can be changed – by the creative team. The brand strategy is a strategy, not the creative. And even if the “word” is pregnant with creative meaning like, say, the word “reboot,” it is really just stimulus for the creative team. (That’s why Campaigns come and go but a powerful brand strategy is indelible.) In step five, the C gets to exhibit strength, power and insight (and have the last word) and yet idea détente is still achieved. We have lift off. Peace! There are all sorts of ad agency segments: pharma, direct response, B2B, digital, CPG, financial, ethnic, entertainment and even a small shop that focuses on baby boomers (AgencyFive0). What there doesn’t seem to be is an agency segment that focuses on the healthy. What I am comfortable talking about is the fact that healthcare is 17-18% of U.S. GDP and a lot of money is changing hands when it comes to medicating, treating and surgically repairing patients. Don’t hold me to this exact data point, but about 20% of medial costs go to prevention and 80% to treatment. That’s wrong. And that’s why there are pharma agencies. Were we to flip that equation, there would be more wellness care and wellness-focused ad shops. It’s a segment that is unique, growing and discrete — and a segment whose time has come. McTrust me. Peace. Nicholas Kristof is a funny dude. In his Op-Ed piece in The NY Times today he suggested the Second Amendment (Don’t run away, it’s not one of those type of posts), affirms our “right to bear a musket.” His reference to period and context got me thinking about advertising and spam. (Sad, I know.) Advertising used to be expensive. If you wanted to reach your custies and prospects you had to produce an ad, which cost money. Then you had to buy media, even more money. You also needed expert middle men to create the ad –either an agency or someone at the media company (“hack,” gesundheit) – also expensive. But today? Today, everyone can make ads. For pennies. Google AdWords. Constant Contact (email). Sponsored Tweets. Facebook. And other internet-enabled options that have created a veritable Spamapalooza. Even before DIY advertising was common, ads weren’t that great. But now? Oye. In this environment is an opportunity. An opportunity to break through the sea of flotsam adverting and spam — with messages that shine. The media is not the message, the message is the message. Find a voice, find your story (brand strategy), understand it and stick to it. Speak to your targets as if you are speaking to your targets – and take off that white shirt with the gravy stain on the stomach. As the kids might say “represent.” Peace. In my world, where I try to look at things in the obverse to gain perspective, this might actually be a strong move for Instagram. Akin to new Coke. The people that really love Instagram will weigh in, not shut down. If the platform is worth saving, and I suspect it is, the masses will help with the solution. New Coke was one of the best things to happen to old Coke and this move by Facebook (recent purchaser of Instagram) will likely end up being the same – though I’m not sure Fothcbook is this devious. More likely they are stepping on their you knows. Hee hee. Monetization is not the enemy. Lack of outside perspective is. In 6-9 months, Instagram will have a new monetization plan in place, whereby some of the photos on the platform will be available for sale, others not, and all will be well. This is the word of the future. Peace! When it comes to advertising and marketing, one of my favorite quotes is “Just when you think you know something about this business, someone comes along to prove you wrong.” Sure, as we move forward through our careers we accumulated a lot of knowledge and experience, but there are always questions that come up in meetings, that defy answers. CEOs of advertising and marketing shops, dudettes and dude paid the big bucks, admit things cone up all the time for which they don’t have answers. That’s what keeps us on our toes. The best we can do as decision-makers is to rely on our instincts, on our body of work and make an informed decision. One of my mentors always had an answer in meetings. And he believed it. The switch was always on or off. His opinions flowed, with grace, logic and conviction. Was he always right? No. And he rode that wave to great career heights. Until a decision or two, while with billion dollar companies, were deemed wrong. Hiccups. So long as we surround ourselves with smart people, so long as we understand that we do not know everything, so long as we have humor and don’t believe ourselves the smartest person in the room, logical, informed marketing decisions will be good ones. Add a little poetry and they can be great ones. Decisions beat inaction and hand wringing every time. Peace. Most marketers speak in tongues. What does that mean? They shovel benefits by the pound. The reason the word “narrative” is so commonly used in ad and digital circles today is because a narrative, by its nature, puts the shovel down. A narrative is a story with beginning, middle and end. If a good story it will have a message, a moral and funnel the reader toward a conclusion. Over this past week, I heard myself talking about teachable moments. Or learnable moments. A learnable moment is when the light goes off in the listener’s brain. When the listener hasn’t been wallpapered with benefit statements, and comes to their own conclusion. Learnable moments stick with consumers, it sticks. If the marketer is the teacher, they get the credit. Trust ensues. As does a smidgen of loyalty. As a kid in the business I wrote an article for Adweek (never submitted) that suggested print ads are only read if they show something you have never seen, tell something you didn’t know, or shared something truly beautiful. Narratives that accomplish these objectives can be powerful selling tools. A narrative that doesn’t pass this litmus not so much — but it still has a better chance as a brand building device than does a shovel filled with benefits. Peace. Words are important, but context more so. Taking the dispatcher’s question out of the mix created a whole new context for Mr. Zimmerman’s quote. Context is rarely the enemy of the brand planner. For those who work on brands with limited budgets, context (an idea pregnant with meaning) is your friend. Contextual turns of a phrase, e.g., “We know where you live” for Newsday, or “webertarian” for Zude.com (combing libertarian and web), use things already in people’s brains to convey information. Webertarian was the Zude target. Though webertarain was pregnant with meaning the product name Zude had little. It rhymed with dude and was similar to Zune but that’s it. Without millions of dollars to promote it, the name was a poor choice. I have a hard time remembering people’s names. How many Brian’s can you meet in a lifetime? The American Indians had it right: Crooked Nose, Crazy Horse, Runs Like Deer…these names are memorable, narrative and contextual. In brand planning you can build it or you can borrow it. Building is better when you are well-funded. Borrowing is faster but can be less differentiated. For my brand ideas, I use context as an appetizer and push for the new big idea as main course. Peace! I first ran into Marshall Kirkpatrick in the blogger’s room at the Web 2.0 Expo in 2007. At the time he was writing for ReadWriteWeb and one of technology’s top 10 bloggers; in the rarified air with Michael Arrington, Robert Scoble, Malik Om, Erick Schonfeld and Jeremiah Owyang. Sitting in on start-up product pitches for a living must have been hard. Then under deadline, having to write about it, explain it and prognosticate — even harder. One would imagine that people like this would have at some point aspired to be involved in a start-up. But not so much. Mr. Kirkpatrick is an exception. His company is called Little Bird. If I got the Is-Does right (I sat through a webinar yesterday) Little Bird is a Social Monitoring 2.0 tool designed to help find category Posters rather than Pasters. The tool feels really smart at first pass. Seeing hundreds of start-up presentations over the years has prepared Mr. Kirkpatrick for the “life.” The funding period(s), naming, first hires, code-fests, Beta testing and pitching. And more pitching. His tech blogging background does not insure a successful tech startup, though it certainly should give him a leg up. I applaud his derring do and look forward following Little Bird’s progress. (Nice name by the way.) Peace.